Are you looking for a scrumptious Patriotic dessert? If so, our Red White + Blue Fruit Pizza will do the trick! Around here we are always looking for creative, beautiful, and tasty recipes that will brighten up our 4th of July celebration. And as a military family we love to show our Patriotic pride through our creations. 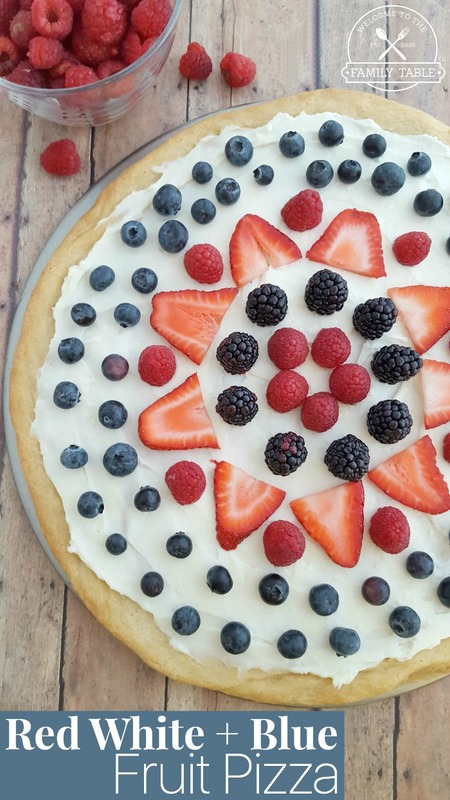 What we love most about this red, white, and blue fruit pizza recipe is that it is not only beautiful but totally delicious. It is always a hit at any celebration we create it for and you can use any fresh fruit you desire. We hope you enjoy! Preheat oven to 375 degrees F. Cover a pizza pan with aluminum foil, spray with cooking spray and set aside. Remove sugar cookie dough from refrigerator and (using your hands) form into a round ball. Place the dough in the center of the prepared pizza pan and begin pressing the dough outward towards the edges. Continue working the dough until there is an even layer covering the pizza pan. Bake for 14 minutes or until edges are a golden brown. It’s very important to allow the dough to completely cool before moving on to the next step. Once cooled, invert the cookie dough onto a large plate or platter. Slowly remove the foil – being careful not to crack the crust. Once the foil is removed, turn the crust over on the plate or platter. To make the frosting, combine cream cheese, sugar and frosting in a mixer. Beat until well blended, then spread onto crust in a thin even layer. 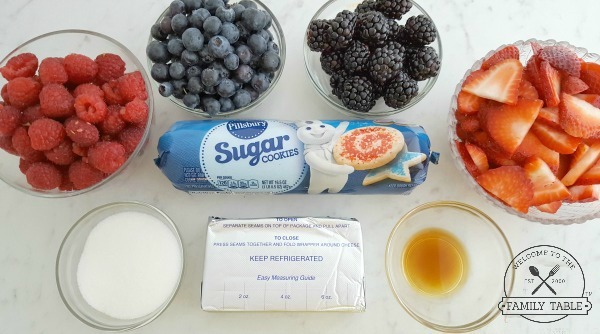 Top the pizza with your favorite combination of fruit or berries, and refrigerate for 1 hour. This delicious and beautiful red, white, + blue fruit pizza is a party pleaser!